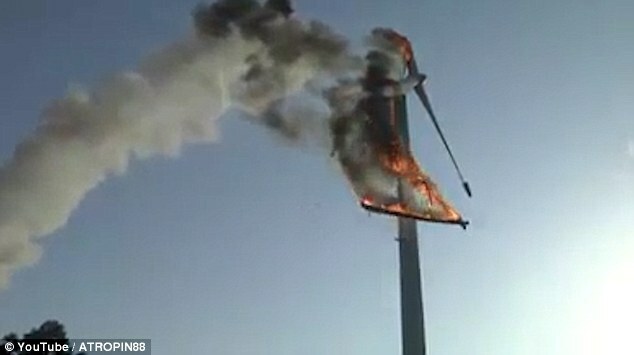 Wind power is, as we’re repeatedly told, ‘clean’, ‘green’ and ‘free’. But, ever keen to rain on the wind industry’s parade, here’s a couple of pieces that point out one or more inconvenient truths. 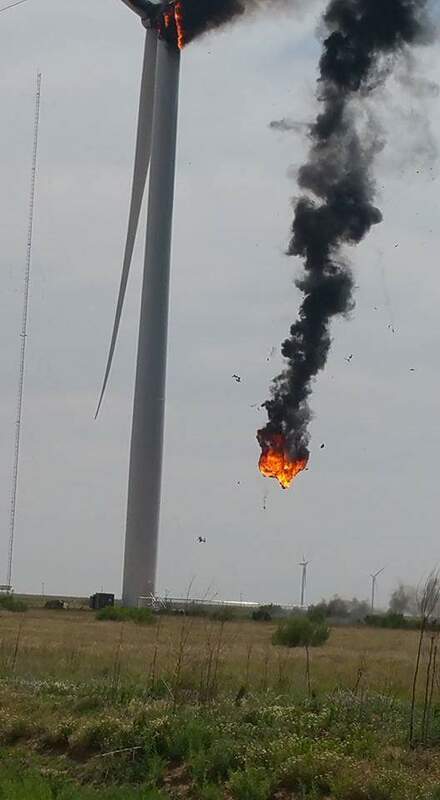 As with the picture above, of a turbine self-immolating in Texas (see our post here) – the first concerns the habit these things have of bursting into a terrifying, toxic fireball. The second details their common trait of giving up their 290 tonne hulks to gravity and tussling with terra firma. 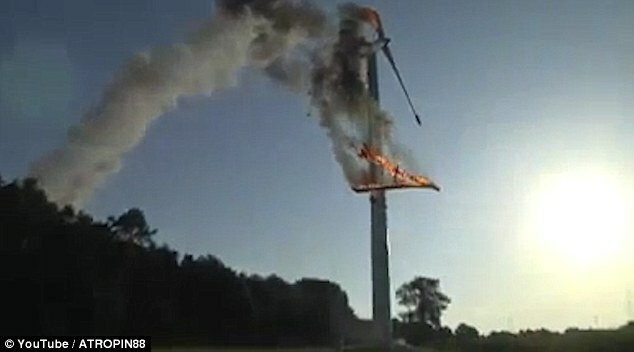 A wind turbine in Germany burned for hours today because fire fighters did not have ladders long enough to tackle the 100 metre high blaze. The flames struck this morning in the town of Isselburg in North Rhine-Westphalia. 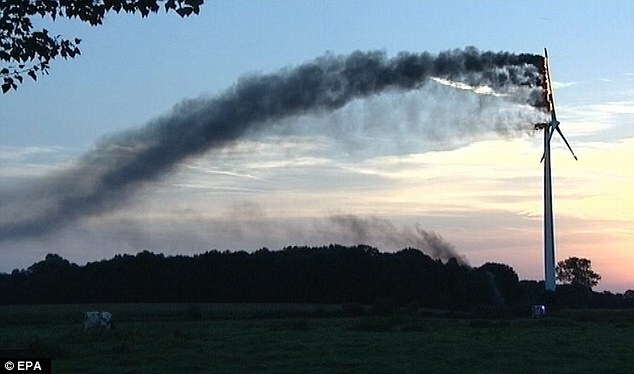 Emergency services were called at 6am to the turbine near Wolf Lake and smoke was seen by motorists on the nearby A3 road. 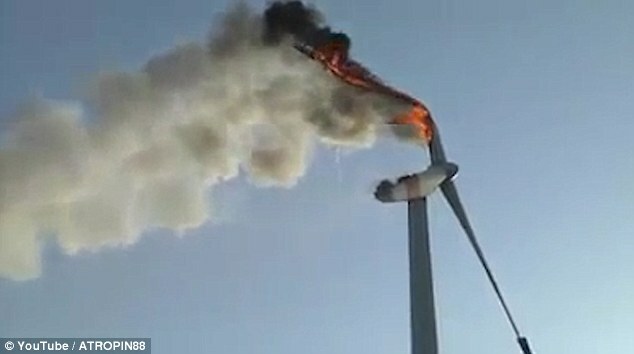 Fire fighters were not able to tackle the 100m blaze so were forced to let the turbine burn and watch the rotor blades fall to the ground. According to initial estimates the damage is estimated to have cost several hundred thousand euros. 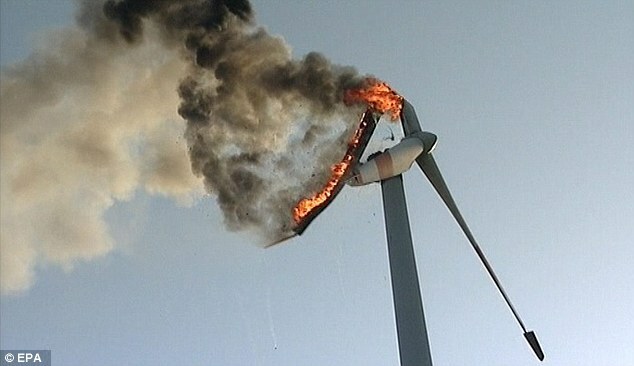 In 2014 research found that nearly 120 wind turbines catch fire every year. The figures, compiled by engineers at Imperial College London and the University of Edinburgh, make fire the second-largest cause of accidents after blade failure. 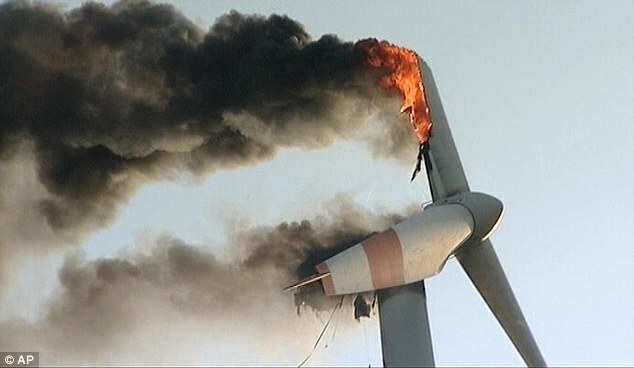 The researchers claim that out of 200,000 turbines around the world, 117 fires took place annually. Fire has a huge financial impact on the industry, the researchers reported in the journal Fire Safety Science. Each wind turbine costs more than £2 million and generates an estimated income of more than £500,000 per year. Any loss or downtime of these valuable assets makes the industry less viable and productive. From their pyrotechnic antics in Germany, let’s head to Canada to catch up on the latest wholesale collapse. 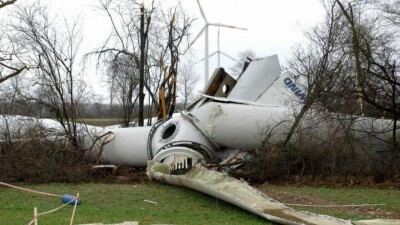 There’s a good reason wind turbines don’t usually collapse. 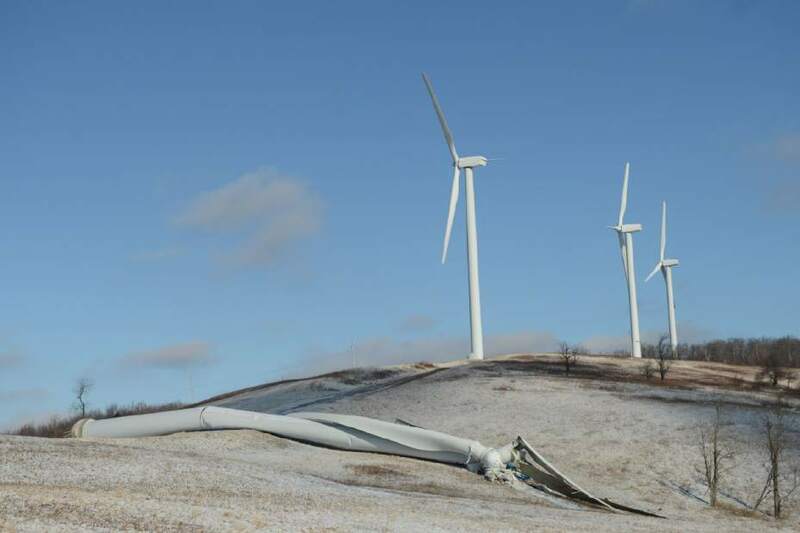 Turbines, like the one that failed catastrophically in Cape Breton last week, get regular inspections and maintenance to keep them at peak performance. Any issue with mechanical efficiency — or worse, downtime — results in a loss of profit. 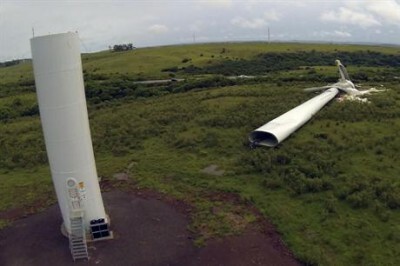 The 20-storey-tall Enercon E-82 turbine that now lies bent over in a wooded area of Nova Scotia was inspected every three to six months by workers with the company. Depending on the turbine’s maintenance cycle, the devices are inspected visually, tested for strong electrical connections or refilled with lubricants. Enercon officials would not confirm the length or specific details about its maintenance contract with Renewable Energy Services Limited (RESL), the main shareholder of the Point Tupper Wind Farm. Enercon officials emphasize the collapse happened during a scheduled component exchange, not during construction, installation or regular operations. While workers were replacing the component, an incident occurred, the company said. 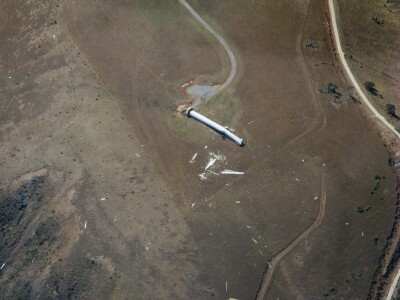 The workers quickly evacuated the site before the turbine’s tower buckled and sent the blades plummeting to the ground. 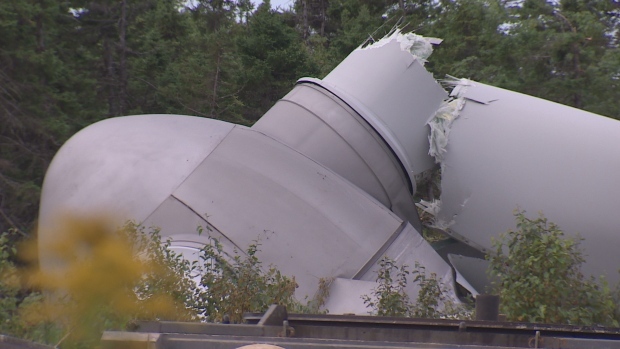 Some residents of Port Hawkesbury say they saw the turbine spinning unusually quickly before it fell. 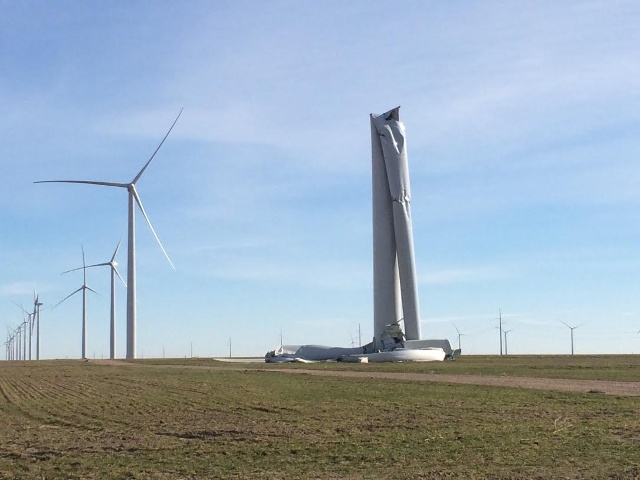 The Canadian Wind Energy Association says this collapse was the first catastrophic failure of its kind in Canada. The turbine’s inspections and maintenance are done almost entirely without government oversight. There is a rigorous approval process to receive provincial and federal authorization to build a turbine, including annual wildlife surveys and extensive community consultation. 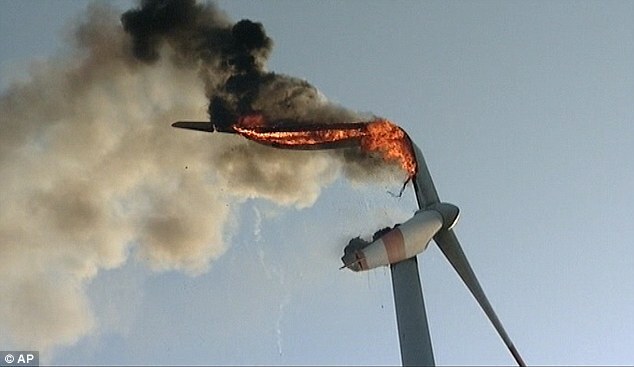 But once a turbine is up, the government is relatively hands off. “I can assure you that for the companies that are putting up these turbines, these are a significant investment,” said Michel Samson, Nova Scotia’s Minister of Energy. The 11 turbines built at the Point Tupper Wind Farm reportedly cost at least $55 million to install. 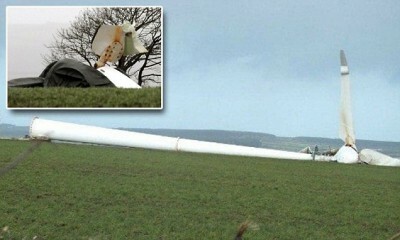 “I don’t think there’s anyone who would want to put a turbine up with fear that it’s going to fall,” Samson said. 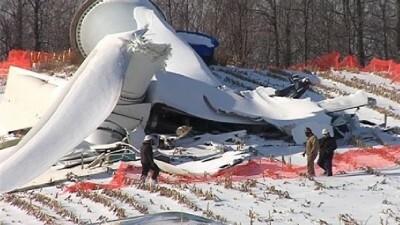 CBC News reckons that “wind turbines don’t usually collapse” because they’re regularly inspected. Oh my, golly gee the whole state of South Australia is without power. A few people might want to start thinking about that long wanted overseas holiday. Pretty boy, you got power over there in Victoria. Gee we might have to bunk in with you the way it’s looking and watch the Bulldogs win the premiership! Here’s hoping anyway pretty boy. Although bad for the people of SA but is the best thing that could happen for the communities that want these companies and their spinning nightmares dead..